On Tuesdays and Thursdays, come in from 4-6PM and get creative! Create a unique terrarium in our 4” glass container or a botanical perfume for $30 and enjoy a beverage of your choice while you do. Sit side by side with a friend even if you choose to create different things! Choose from a house wine or a bubbly beer, one glass is included for each attendee. Making a terrarium involves taking elements of nature and arranging them in a way that is exquisite. We host your experience while our terrarium booklet works to guide you through the creative process. All you need is included: a glass container, sand, rocks, moss, plants, and unique natural treasures to personalize and create your own terrarium. If you care to upgrade, we have plenty of specialty glass available. We will sit you at our Botanical Library with a specially designed kit of natural essences. You will encounter scents of tobacco and rose, leather and jasmine, blood orange and cognac! 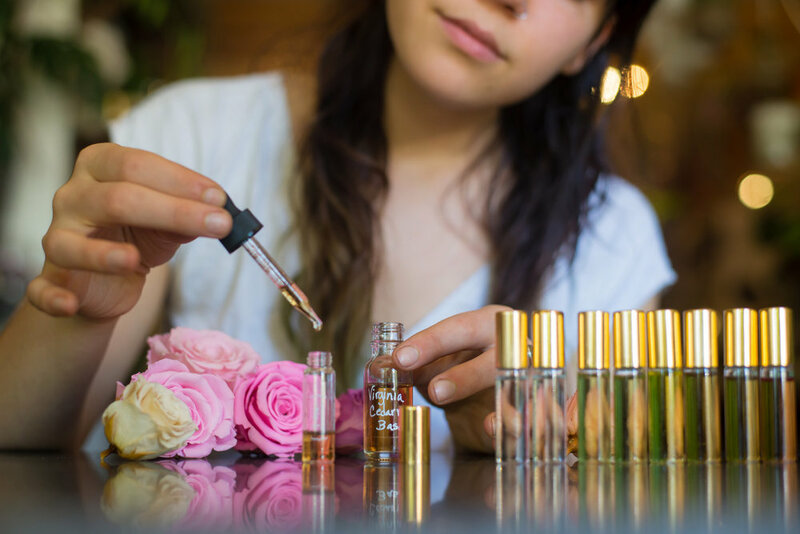 We host your experience while our perfume booklet works to guide you through the creative process. All you need is included at our Essence Bar.